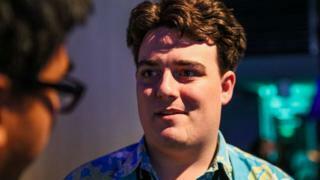 Palmer Luckey, the founder of VR firm Oculus, has left the company. Mr Luckey was closely associated with the rise to prominence of Oculus and its VR headset which finally went on sale in early 2016. Facebook, which owns Oculus, gave no details about why Mr Luckey left the firm or what he planned to do next. His departure caps a troubled period for Oculus which lost a $500m (£400m) court case against media firm Zenimax which said it stole trade secrets. The court case was partly brought about because Zenimax accused Mr Luckey of violating a non-disclosure agreement he signed with the firm in 2014. Facebook and Oculus have appealed against the damages award. "Palmer will be dearly missed," said Facebook in a statement given to tech news site Ars Technica. It said that his "inventive spirit" helped to "kickstart" recent interest in VR and get the industry going. It said it wished him well in future ventures. No personal statement from Mr Luckey about his future plans has yet appeared. Mr Luckey had been the public face of Oculus since 2012 and regularly gave presentations at industry events about VR's potential. However, he became a controversial figure last year when it emerged that he had partly bankrolled a group behind a social media campaign helping Donald Trump's presidential bid. Widespread criticism of his involvement with the pro-Trump group prompted Mr Luckey to apologise for the effect the revelation had had on perceptions of Oculus. The publicity meant Mr Luckey appeared far less often at Oculus events. He was entirely absent from the company's flagship Connect conference last year. As founder and major shareholder of Oculus, Mr Luckey received a significant payout when Facebook bought the company in 2014 for $2bn.